Prostate cancer is the most commonly diagnosed cancer in men worldwide and is the second leading cause of cancer related mortality. The underlying mechanisms of the carcinogenesis and the progression of the disease remain largely obscure. Epidemiological studies have shown that dietary, genetic and other environmental factors may be involved in the development of the prostate cancer. The environment-gene interaction in carcinogenesis is well reflected by phase-I and phase-II enzymes that are involved in the metabolism of carcinogens. Phase-II enzymes such as Glutathione-S transferase, N- acetyltransferase and epoxide hydrolase are involved in the detoxification of chemical carcinogens and subsequently their role is expected to be protective. The study group consisted of 103 prostate cancer patients with mean age 62.5 ± 10.2 and 117 controls (benign prostate hyperplasia) with mean age of 54.5±13.9 Mean value of prostate serum antigen for prostate cancer patients were 12.5 ng/dl and for controls group were 3.4 ng/dl. Criteria for the patient selection were based on questionnaire covering medical, pathological, and histo-pathological records from the outpatient department of Sanjay Gandhi postgraduate institute of medical science, Lucknow from December 2001- December 2003. Only histologically confirmed prostate cancer patients were included. All cancer patients were higher Gleason scores (6-9) and in advance stage. Informed consent of the participants (cases and controls) was taken. Ethnic origin and race for cases and controls were similar. The inclusion criteria for the controls (only men) were absence of any prior history of cancer or pre-cancerous lesions. Serological (prostate serum antigen, < 4ng /dl), physical (digital rectal examination) and radiological examinations were performed in all controls individual in order to exclude the possibility of other malignancy The consumption of tobacco in any form (Cigarette/ Bidi smoking, chewing tobacco in beetle leaf or gutka etc.) in both groups was noted through a detailed questionnaire. Five ml of blood was collected in sterile EDTA vials from all subjects after informed consent. DNA was extracted from blood lymphocytes using the Proteinase K and phenol chloroform extraction procedure. Analysis for GSTM1 and GSTT1 gene polymorphism was done by multiplex PCR as described by Abdel- Rehman et al. Isolated DNA (100-500ng) was amplified in a total volume of 25 ml reaction mixture containing 18.75 pmol of each of the following primers. GSTM1: F- 5'-GAACTCCCTGAAAA GCTAAAGC-3'andR:5'-GTTGGGCTCAAATA TACGGTGG-3';GSTT1:F:5'-TTCCTTACTGGTCCT CACATCTC-3',R:5'TCACGGGATCATGGCC AGCA-3'. As an internal control, exon7 of CYP1A1 genes was co-amplified using the following primer F: 5'-GAACTGCCACTTCAGCTGTCT-3' and R: 5'CAGCTGCATTTGGAAGTGCTC-3'. Each set of reaction included both positive and negative controls. The multiplex PCR method was used to detect the presence or absence of the GSTT1 and GSTM1 genes in the genomic DNA samples, simultaneously in the same tube. The reaction mixture was subjected to initial denaturation at 94ºC for 2 min, followed by 35 cycles of 94ºC for 2 min, 59ºC for 1 min and 72ºC for 1 min. The final extension was done at 72ºC for 10 min. DNA from positive for GSTM1 and GSTT1 genotypes yielded bands of 215 bp and 480 bp respectively while the internal positive control (CYP1A1) PCR product corresponded to 312 bp. The study included 103 cases and 117 controls. 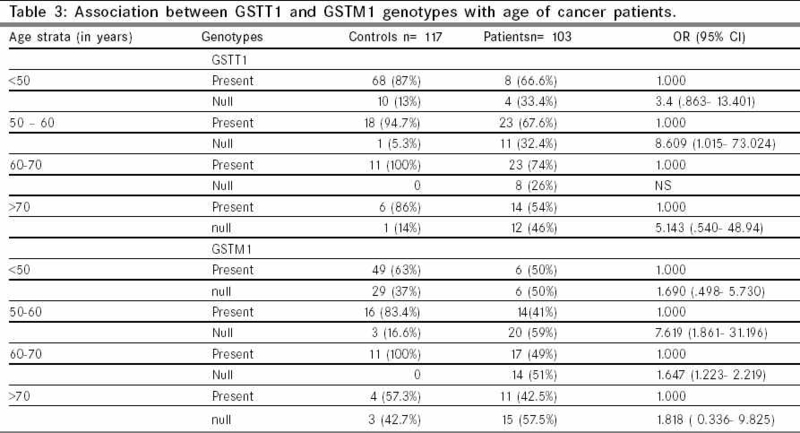 The distribution of the genotypes of GSTT1 and GSTM1 in control and cancer patients (Ca-P) is shown in [Table - 1]. Detection of GSTT1 and GSTM1 null allele homozygotes was carried out by sequence- specific amplification using CYP1A1 gene as an internal control. Among patients with prostate carcinoma 34%were homozygous for the GSTT1 null allele as compared to the11% among the controls [Figure - 1] ( 2 <0.000, Fisher P=0.000, OR = 4.12.CI = 2.03-8.34). Similarly for patients with prostate cancer 53% were homozygous for the GSTM1 null allele as compared to the 30% controls ( 2 P=0.001, Fisher P=0.001, OR = 2.69.CI = 1.54-4.67). Accordingly, a comparison between prostate carcinoma patients and male controls yielded statistically significant difference for null genotypes of GSTT1, GSTM1. The association between tobacco usage and changes in null alleles of GSTT1 and GSTM1 of patients and controls are summarized in [Table - 2]. The null genotypes were higher in both tobacco users and non-users. In fact, the OR for both GSTT1 and GSTM1 null genotypes was significantly higher in non-users than tobacco users. We also tried to study an association between GSTT1/ GSTM1 genotypes and age of cancer patients. The frequency of GSTT1 and GSTM1 null genotypes on age strata in patients and controls are summarized in [Table - 3]. The frequency distribution of GSTT1 null genotypes in cancer patients at all ages >50 years was significantly more than the controls. However, GSTM1 null genotype alleles were observed to have significant distribution in the age range of 50-60 only in prostate cancer as compared to the controls. The results of our study and other reports suggest that polymorphic variations in the glutathione S-transferase (GSTs) are associated with cancer susceptibility. It is assumed that the presence of carcinogen-metabolizing enzymes in human prostate with a high inter-individual variability may be involved in the regulation of local levels of carcinogens and mutagens and may underlie interindividual differences in cancer susceptibility. Moreover GSTs also modulate the induction of other enzymes and proteins important for cellular functions. Hence this class of enzyme is important for maintaining cellular genomic integrity and as a result plays an important role in cancer susceptibility. 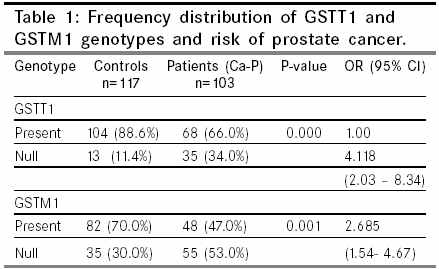 The results observed indicated that null genotypes of GSTM1 and GSTT1 envisage higher risk for prostate cancer as compared to controls [Table - 1]. Our observations concur with previous report in Chilean population where an increased risk of prostate cancer for GSTM1 null genotype was observed; however, differ from USA population where decreased risk of prostate cancer for GSTM1 null genotype was observed. On the contrary in German, Japanese, Portuguese, United Kingdom, and in American studies, no association of GSTM1 null genotype could be established. In the present study, we observed that GSTT1 null genotype was even more prevalent among prostate cancer patients. Since GSTT1 particularly is strongly involved in the metabolism of lower molecular weight electrophillic molecules the decreased frequency of genotype encoding active GSTT1 than GSTM1 might reflect a greater role of carcinogens of this kind., Interestingly our observation matches to that reported in Scandinavian and German population, but differ from recent American study in prostate cancer patients where an increased frequency of GSTT1positive genotypes was found independent of race. However, in Japanese, Portuguese, United Kingdom, Chilean, and in American studies reported non- significant association. These variations may be possibly attributed to the underlying geographic/ethnic factors. The association between genetic susceptibility and exposure to the primary environmental risk factor for prostate cancer-tobacco was also investigated [Table - 2]. Usually this increase is particularly pronounced among smokers but since the smoking status of the patients was not quantitated sufficiently and due to small number of patients, no significant association could be established between the smokers and non-smokers. It appears that the effect of GSTM1/GSTT1 null alleles is obviously strong enough to be discerned even without prior stratification according to tobacco exposure. Of the various ages strata selected [Table - 3] the age between 50-60 years exhibited significant variation between the control and the cancer patients for GSTT1 and GSTM1 null genotypes. This clearly demonstrated that the changes in null genotypes were most significantly pronounced during this age, which also corresponds to cancer susceptibility. This observation is also in agreement to those reported by Chen et al. There is abundant evidence that polymorphism in individual GST genes are important modulators of cancer susceptibility. The present study indicates that both GSTM1 and GSTT1 genotypes may nevertheless be relevant since an approximate 2-3 fold greater prevalence of null allele homozygotes were found among the prostate carcinoma patients as compared to controls. To the best of our knowledge, this is the first genetic study in Indian population in prostate cancer, which demonstrated that null alleles of GSTT1 and GSTM1 are strong predisposing risk factors for prostate cancer in the North India. The authors are grateful to the Director, Sanjay Gandhi PGIMS for providing the necessary facilities. One of us (D.S.L. Srivastava) is thankful to Council of Scientific and Industrial Research, New Delhi, for awarding research fellow ship. 1. Perera FP. Environment and cancer: Who are susceptible? Science 1997;278:1068-73. 2. d'Errico A, Taioli E, Xhen X, Vineis P: Genetic polymorphism and the risk of cancer: A review of the literature. Biomarkers 1996;1:149-73. 3. Hirvonen A, Husgafvel-Pursiainen K, Anttila S, Vianio H. The GSTM1 null genotype as a potential risk modifier for squamous cell carcinoma of the lung. Carcinogenesis 1993;14:1479-81. 4. Lin HJ. Han CY, Bernstein DA, Hsiao W, Lin BK, Hardy S. Ethnic distribution of glutathione S-transferase Mu1-1 (GSTM1) null genotype in 1473 individuals and application to bladder cancer susceptibility. Carcinogenesis 1994;15:1077-81. 5. Zhong S, Wyllie AH, Barnes D, Wolf CR, Spurr NK. Relationship between the GSTM1 genetic polymorphism and susceptibility to bladder, breast and colon cancer. Carcinogenesis 1993;14:1821-24. 6. Nair UJ, Nair J, Mathew B, Bartsch H. Glutathione S-transferase M1 and T1 null genotypes as risk factors for oral leukoplakia in ethnic Indian betal quid/tobacco chewers. Carcinogenesis 1999;20:743-48. 7. Sreelekha TT, Ramadas K, Pandey M, Thomas G, Nalinakumari KR, Pillai MR. Genetic polymorphism of CYP1A1, GSTM1 and GSTT1 genes in Indian oral cancer. Oral Oncology 2001;37:593-98. 8. Buch SC, Notani PN, Bhisey RA. Polymorphism at GSTM1, GSTM3 and GSTT1 gene loci and susceptibility to oral cancer in an Indian population. Carcinogenesis 2002;23:803-7. 9. Autrup, JLC, Thomassen LH, Olsen JH,Wolf H, Autrup H. Glutathione S-transferase as risk factors in prostate cancer. Eur J Cancer Prev 1999;8:525-32. 10. Steinhoff C, Frank KH, Golka K, Thier R, Romer HC, Rotzel C, et al: Glutathione transferase isozyme genotypes in patients with prostate and bladder carcinoma. Arch Toxicol 2000;74:521-4. 11. Nakazato H, Suzuki K, Matsui H, Koike H, Okugi H, Ohtake N, et al. Association of genetic polymorphisms of glutathione-S-transferase genes (GSTM1, GSTT1 and GSTP1) with familial prostate cancer risk in a Japanese population. Anticancer Res 2003;23:2897-902. 12. Samir NK, Sharon L. Kardia R, Amy H. Walker, Alan JW, et al. The Glutathione S-Transferase-m and -u Genotypes in the Etiology of Prostate Cancer: Genotype-Environment Interactions with Smoking. Cancer Epidemiology Biomarkers & Prevention 2000;9:1329-1334. 13. Medeiros R, Vasconcelos A, Costa S, Pinto D, Ferreira P, Lobo F, et al. Metabolic susceptibility genes and prostate cancer risk in a southern European population: The role of glutathione S-transferases GSTM1, GSTM3, and GSTT1 genetic polymorphisms. Prostate 2004;58:414-20. 14. Kote-Jarai Z, Easton D, Edwards SM, Jefferies S, Durocher F, Jackson RA, et al. Relationship between glutathione S-transferase M1, P1 and T1 polymorphisms and early onset prostate cancer. Pharmacogenetics.2001;1:325-30. 15. Sambrook J, Fritsch E, Maniatis T. Molecular Cloning-A Laboratory Manual 2nd Ed. Cold Spring Harbor, NY: Cold Spring Harbor Laboratory Press 1989. 16. Abdel-Rahman SZ, Anwar WA, Abdel-Aal., Mostafa HM, Au WW: GSTM1 and GSTT1 genes are potential risk modifiers for bladder cancer. Cancer Detection and Prev 1998;22:129-38. 17. Murata M, Shiraishi T, Fukutome K, Watanabe M, Nagao M, Kubota Y, Ito H, Kawamura J, Yatani R. Cytochrome P4501A1 and glutathione S-transferase M1 genotypes as risk factors for prostate cancer in Japan. Jpn J Clin Oncol. 1998;28:657-60. 18. Acevedo C, Opazo JL, Huidobro C, Cabezas J, Iturrieta J, Quinones Sepulveda L. Positive correlation between single or combined genotypes of CYP1A1 and GSTM1 in relation to prostate cancer in Chilean people. Prostate 2003;57:111-7. 19. Rebbeck TR, Walker AH, Jaffe JM, White DL, Wein AJ, and S. Malkowicz B. Glutathione S-transferase mu (GSTM1) and theta (GSTT1) genotypes in the etiology of prostate cancer. Cancer Epidemiol Biomarkers Prev 1999;8:283-7. 20. Vander-Gulden JW, Kolk JJ, Verbeek AL. Prostate cancer and work environment. J Occup Med 1992;34:402-9. 21. Guengerich FP, Their R, Persmark M, Taylor JB, Pemble SE, Ketterer B. Conjugation of carcinogen by theta class glutathione S-transferase; mechanism and relevance to variations in human risk. Pharmacogenetics 1995;5:S103-7. 22. Kidd LC, Woodson K, Taylor PR, Albanes D, Virtamo J, Tangrea JA.Polymorphism of glutathione-S-transferase genes (GST M1, GST-T1 and GST-P1) and susceptibility to prostate cancer among male smokers of the ATBC cancer prevention study. Eur J Cancer Prev 2003;12:317-20. 23. Chen S, Xue K, Xu L, Ma G, Wu J. Polymorphism of the CYP1A1 and GSTM1 genes in relation to individual susceptibility to lung carcinoma in Chinese population. Mutat Res Genomics 2001;458:41-7.